Sue Lane nurtured her garden for 35 years whilst living in her thatched, timber framed 17th century cottage in the Sutton Scotney Conservation Area. 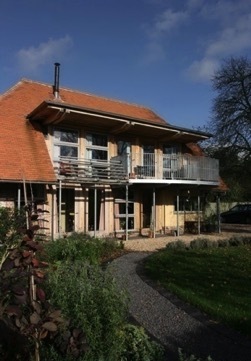 In commissioning a new cottage to be built in part of the established garden, Sue wanted to take with her the memory of the oak frame, lime render and joy of traditional craftsmanship, whilst adding the advantages of low energy, stacks of natural light and modern passive solar energy design. Because the new cottage is south facing, advantage is taken by allowing the low winter sun to penetrate deep into the building; and just as importantly, this large glazed area is shaded in summer to reduce excessive heat gain in such a well insulated building. 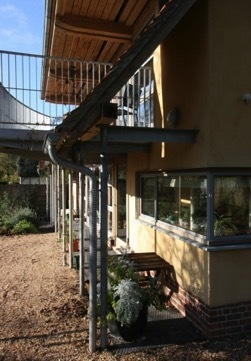 As part of this strategy, the roof eaves are extended and a lower canopy and galvanised steel balcony are formed, facilitating views over the countryside and also providing a physical framework for Sue’s plants to climb and colonise. The cottage is formed with an oak cruck frame, giving strength and stability, with curved oak arching timbers meeting at the ridge; a structural principal once used to form open halls or barns. 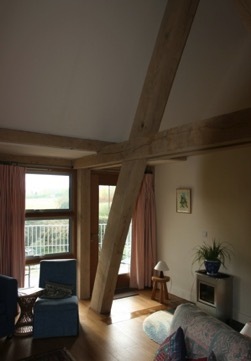 In this oak cottage, however, the tie beams extend to form the first floor platform, which creates a balanced and efficient structural entity. 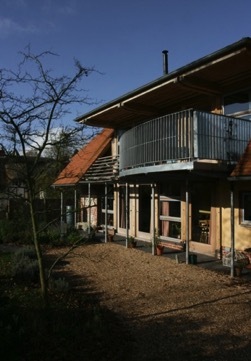 The design has been recognised in the Galvanising Awards 2012 for its creative use of steel in the protection of the glazed oak frame south elevation.